A Gujarati poet gets us to visualise and feel the magnificence of the Supreme Being through His extraordinary creation. A physical description of His visage and limbs of huge proportions is likely, in all probability, to be laughable. Kavi Nanalal instead conjures up with his lofty imagination in a six-line gem of a poem Virat-no Hindolo. His cosmic swing. If at all, invisibly He rests on this swing. Or, does He also, like any one of us, only gaze at this creation in amazement? It’s the swing of Trilok and the ropes are tied to the beam across the sky! Nanalal was born on Chaitri Padwo, the day of the full moon, symbolic of his fully flowered creativity. 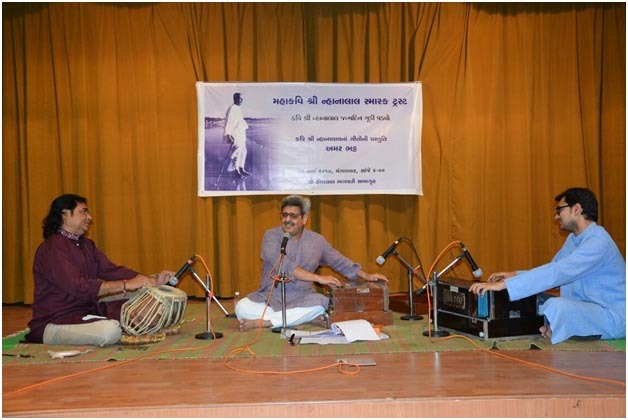 To celebrate the day, Vishwakosh invited Amar Bhatt with the poet’s songs in his repertoire. As expected, with delicate evocation Amar sang a few of his songs that are part of the heritage of Gujarati poetry. “Nanalal’s genius,” Kumarpal Desai rightly said in his introductory observations, “Gujarat has not fully recognised.” It is especially true of this poet, who is often fondly called Mahakavi, that you get a feel of him when he is sung in a way that reveals delicate nuances of his lyrical words. Virat-no Hindolo is a creation of exceptional imagination and verily did Amar give glimpses of that height in his rendering, reminding one of, as he himself recalled, Pt Omkarnath Thakur’s singing of it. In the grand vision of the hindolo of the universe, Nanalal is in the affinity with Tagore and Narasinh and, if you recall aap-ni yaadi, with Kalapi. At the other end of the scale, with the softness of syllabic sounds and the delicate feelings they carry, he has kinship with Jayadev, who created Geetagovind. Complementing each other, sound and sense magically combine in Jheena jharamar varase meh, bheenje maari choondali and the singer carries this magic across to the listeners, who with a mild thrill warmly keep silently responding to him. Amar Bhatt’s is no sabharanjani style. It is his cultivated literary sensibility enabling him to perceive and fondly present a poet’s words musically with their resonating dhwani that fascinates. What add to the enjoyment of listening to songs are also his incidental observations that help one appreciate poetry and its music in a larger context. Ke aabhamaa-n toran bandhaana-n triloknaa-n takes off on a higher note, he points out, because the line refers to stringed decorations up in the sky. He goes on to explain how the initial syllable ke and the last one re in the line help a smooth rhythmic beginning and end – with illustrations from other poets as well. As he turns to chandrie amrut mokalyaa-n re b-hen, he reminds his keen listeners that Dayaram’s garabe ramavaane gori neesaryaa-n re lol is in the same singing pattern. Listening to this singer helps appreciate the finer qualities of songs better.